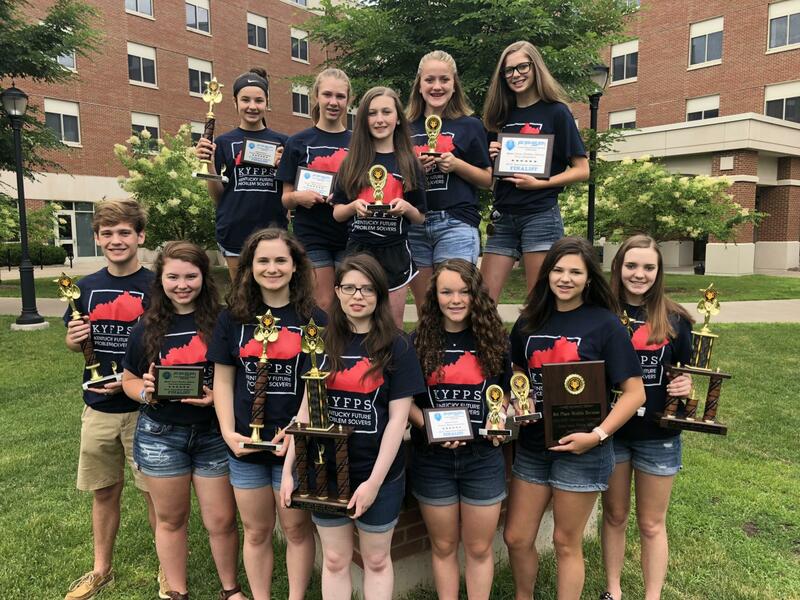 Heath Middle School and McCracken County High School FPS teams attended the Future Problem Solving International Conference on June 6-12 to compete in the International Finals. Melissa Bryan is the coach for the Jr Division Team (6th grade), Middle Division Team (7th-9th grade), and Senior Division Team (10th-12th grade). The Heath Middle School team placed 8th in the world for Team Global Issues Problem Solving. Team members are Ava Kelly, Abby Beth, Karsyn Allard, and Hannah Bryan. They qualified for Internationals after placing 2nd at State Finals. This is the first time the team division has placed in the top 10 for International Finals. Team division includes the top 64 teams in the world and is considered one of the highest honors at the Conference. Katelyn Woodard placed 2nd in the world for Individual Global Issues Problem Solving in the Senior Division. This competition is similar to team division but is completed by a single student alone. This is her second International title in Individual Competition and she qualified for the competition after placing 2nd at State Finals. Hannah Hatton placed 4th in the world for Individual Scenario Writing in the Middle Division. This was our first International title for Individual Scenario Writing. She also placed 3rd in the world for Team Scenario Writing in the Middle Division. She qualified for the competition after placing 3rd at State Finals. She also placed 7th in Individual Problem Solving at State Finals. Mya Kelly placed 2nd in the world for Team Scenario Writing in the Junior Division. She qualified for this competition after placing 1st at State Finals in Individual Scenario Writing. For Team division, she was placed with 3 students from other affiliates around the world to complete a scenario. Bailey Bowland placed 1st in the Multi-Affiliate Global Issues Competition for the Middle Division. Noah Ellis place 2nd for the Senior Division. For this competition, they were placed with 3 other students from other affiliates around the world to complete a booklet. Olivia Dodge qualified as a finalist in Individual Scenario Writing for Middle Division after placing 1st at State Finals. She completed in the team scenario writing competition. Haydyn Pope qualified as a finalist in the Multi-Affiliate Global Issues Competition for Junior Division and Hannah Johnson qualified as a finalist in Middle Division.